Ribbon: Red with two narrow white edge stripes. Awarded: For service in a specific operation beyond the shores of Denmark. 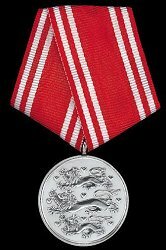 The medal is unusual in that the same ribbon and obverse are used for all awards, but the reverse is specific to the operation for which the medal is awarded.